America is a very religious country, more so than any other industrialized nation. Religious identity is not always reflected in religious service attendance. We are more religiously polarized than we were 30 or 40 years ago. o 10% of Americans say that only one religion is true. o 7% or 8% of Americans say there is very little truth in any religion. o Over 80% of Americans say there is basic truth in many religions. The majority of evangelical Christians say that Jesus is the only way to God. The majority of evangelical Christians also say that non-Christians can go to heaven. The culture wars, starting in the late 70s and early 80s, caused many younger people to turn away from institutional religion. 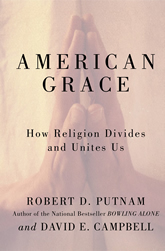 They began to associate religion with being politically conservative and angry. If that trend continues, we’ll see a sharp decline in religious belonging over the next 20-30 years. Religious Americans are better citizens than our secular neighbors. They are more likely to volunteer, give to charity, know their neighbors, participate in community projects, etc. This includes giving to secular charities and participating in secular projects. More than half of all marriages cut across religious traditions. Children benefit from being actively involved in a religious community (regardless of which one). 1/3 of all Americans are now in a religion different than the one they were raised in. Definitely worth a listen—check it out. Where do we get out?